Prokaryotes fix nitrogen into a form that can be used by eukaryotes. Prokaryotes perform biological nitrogen fixation (BNF) to convert nitrogen gas from the atmosphere into ammonia, which can be used by eukaryotes to form important biomolecules such as amino acids and nucleic acids. Although most nitrogen fixation is performed by prokaryotes, abiotic processes, such as industrial processes and lightning, can also fix nitrogen. Some bacteria form symbiotic relationships with legumes, which provide oxygen-free nodules on their roots for nitrogen fixation to occur; this process allows ammonia to form naturally from atomspheric nitrogen to act as fertilizer for soils. Nitrogen is a very important element for living things because it is part of the nucleotides and amino acids that are the building blocks of nucleic acids and proteins, respectively. Nitrogen is usually the most limiting element in terrestrial ecosystems. Atmospheric nitrogen, N2, provides the largest pool of available nitrogen. However, eukaryotes cannot use atmospheric, gaseous nitrogen to synthesize macromolecules. Fortunately, nitrogen can be “fixed,” meaning it is converted into ammonia (NH3) either biologically or abiotically. Abiotic nitrogen fixation occurs as a result of lightning or by industrial processes. The total fixed nitrogen through BNF is about 100 to 180 million metric tons per year. Biological processes contribute 65 percent of the nitrogen used in agriculture. Cyanobacteria are the most important nitrogen fixers in aquatic environments. In soil, members of the genus Clostridium are examples of free-living, nitrogen-fixing bacteria. Other bacteria live symbiotically with legume plants, providing the most important source of BNF. 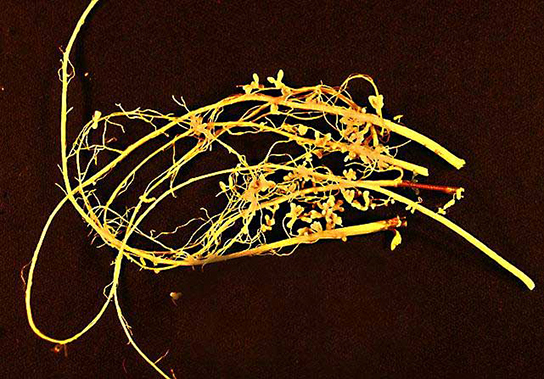 Symbionts may fix more nitrogen in soils than free-living organisms by a factor of 10. Soil bacteria, collectively called rhizobia, are able to symbiotically interact with legumes to form nodules: specialized structures where nitrogen fixation occurs. Nitrogenase, the enzyme that fixes nitrogen, is inactivated by oxygen, so the nodule provides an oxygen-free area for nitrogen fixation to take place. This process provides a natural and inexpensive plant fertilizer as it converts (reduces) atmospheric nitrogen to ammonia, which is easily usable by plants. The use of legumes is an excellent alternative to chemical fertilization and is of special interest to sustainable agriculture, which seeks to minimize the use of chemicals and conserve natural resources. Through symbiotic nitrogen fixation, the plant benefits from using an endless source of nitrogen: the atmosphere. Bacteria benefit from using photosynthates (carbohydrates produced during photosynthesis) from the plant and having a protected niche. Additionally, the soil benefits from being naturally fertilized. Therefore, the use of rhizobia as biofertilizers is a sustainable practice. Location of Nitrogen Fixation: Soybean (Glycine max) is a legume that interacts symbiotically with the soil bacterium Bradyrhizobium japonicum to form specialized structures on the roots called nodules where nitrogen fixation occurs. Some legumes, like soybeans, are also key sources of agricultural protein. Some of the most important legumes are soybean, peanuts, peas, chickpeas, and beans. Other legumes, such as alfalfa, are used to feed cattle. Some of the earliest biotechnology used prokaryotes for the production of food products such as cheese, bread, wine, beer, and yogurt. Prokaryotes and other microbes are beneficial to some food production by transforming textures, providing flavors, producing ethanol, and providing protection from unwanted microbes. Bacteria breakdown proteins and fats into a complex mix of amino acids, amines, and fatty acids; this processing alters the food product. Many food production processes rely on the fermentation of prokaryotes and other microbes to produce the desired flavors; in the case of beer and wine, they also affect the desired amount of ethanol. According to the United Nations Convention on Biological Diversity, biotechnology is “any technological application that uses biological systems, living organisms, or derivatives thereof, to make or modify products or processes for specific use. ” The concept of “specific use” involves some sort of commercial application. Genetic engineering, artificial selection, antibiotic production, and cell culture are current topics of study in biotechnology. However, humans have used prokaryotes before the term biotechnology was even coined. Some of the products are as simple as cheese, bread, wine, beer, and yogurt,which employ both bacteria and other microbes, such as yeast. 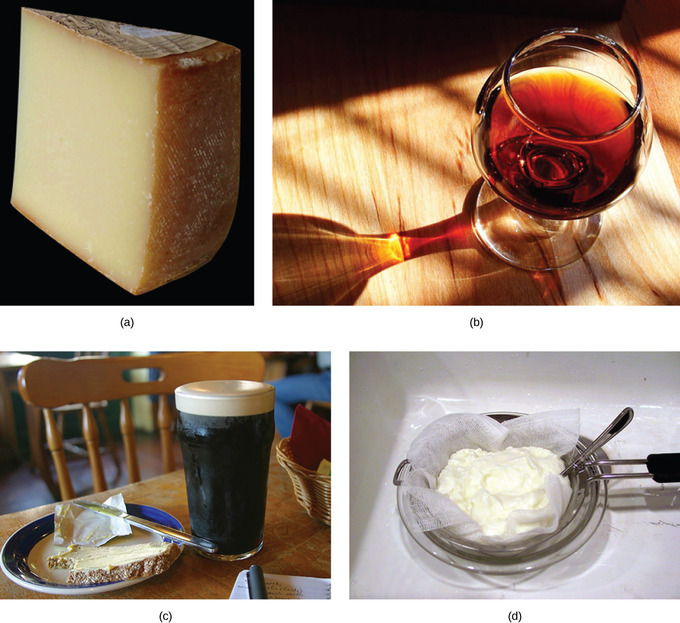 Products made using prokaryotes: Some of the products derived from the use of prokaryotes in early biotechnology include (a) cheese, (b) wine, (c) beer and bread, and (d) yogurt. Cheese production began around 4,000–7,000 years ago when humans began to breed animals and process their milk. Fermentation, in this case, preserves nutrients because milk will spoil relatively quickly, but when processed as cheese, it is more stable. A required step in cheese-making is separating the milk into solid curds and liquid whey. This usually is done by acidifying the milk and adding rennet. The acidification can be accomplished directly by the addition of an acid like vinegar, but usually starter bacteria are employed instead. These starter bacteria convert milk sugars into lactic acid. The same bacteria (and the enzymes they produce) also play a large role in the eventual flavor of aged cheeses. Most cheeses are made with starter bacteria from the Lactococci, Lactobacilli, or Streptococci families. As a cheese ages, microbes and enzymes transform texture and intensify flavor. This transformation is largely a result of the breakdown of casein proteins and milkfat into a complex mix of amino acids, amines, and fatty acids. Some cheeses have additional bacteria or molds intentionally introduced before or during aging. In traditional cheesemaking, these microbes might already be present in the aging room; they are simply allowed to settle and grow on the stored cheeses. More often today, prepared cultures are used, giving more consistent results and putting fewer constraints on the environment where the cheese ages. Records of brewing beer date back about 6,000 years to the Sumerians. Evidence indicates that the Sumerians discovered fermentation by chance. Wine has been produced for about 4,500 years. The production of beer and wine use microbes, including both yeast and bacteria, to produce ethanol during fermentation as well as provide flavor to the beverage. Similarly, bread is one of the oldest prepared foods. Bread-making also uses the fermentation of yeast and some bacteria for leavening and flavor. Additionally, evidence suggests that cultured milk products, such as yogurt, have existed for at least 4,000 years. These products use prokaryotes (as with cheese) to provide flavor and to protect the food product from other unwanted microbes. Bioremediation occurs when prokaryotes clean up a polluted environment through the natural breakdown of pollutants. To clean up oil spills, bacteria are introduced to the area of the spill where they break down the hydrocarbons of the oil into carbon dioxide; this is an example of bioremediation. Toxic metals, such as mercury (II), can be converted into nontoxic forms, such as mercury (0), by bacteria. Using natural organisms as examples, scientists can engineer bacteria for improved bioremediation of desired pollutants. Bioremediation can remove oil, some pesticides, fertilizers, and toxic chemicals, such as arsenic, from the environment. Microbial bioremediation is the use of prokaryotes (or microbial metabolism) to remove pollutants. Bioremediation has been used to remove agricultural chemicals (pesticides, fertilizers) that leach from soil into groundwater and the subsurface. Certain toxic metals and oxides, such as selenium and arsenic compounds, can also be removed from water by bioremediation. The reduction of SeO4-2 to SeO3-2 and to Se0 (metallic selenium) is a method used to remove selenium ions from water. Mercury is an example of a toxic metal that can be removed from an environment by bioremediation. As an active ingredient of some pesticides, mercury is used in industry and is also a by-product of certain processes, such as battery production. Methyl mercury is usually present in very low concentrations in natural environments, but it is highly toxic because it accumulates in living tissues. Several species of bacteria can carry out the biotransformation of toxic mercury into nontoxic forms. These bacteria, such as Pseudomonas aeruginosa, can convert Hg+2 into elemental Hg0, which is nontoxic to humans. One of the most useful and interesting examples of the use of prokaryotes for bioremediation purposes is the cleanup of oil spills. The importance of prokaryotes to petroleum bioremediation has been demonstrated in several oil spills in recent years, such as the Exxon Valdez spill in Alaska (1989), the Prestige oil spill in Spain (2002), the spill into the Mediterranean from a Lebanon power plant (2006), and, more recently, the BP oil spill in the Gulf of Mexico (2010). To clean up these spills, bioremediation is promoted by the addition of inorganic nutrients that help bacteria to grow. Hydrocarbon-degrading bacteria feed on hydrocarbons in the oil droplet, breaking down the hydrocarbons. Some species, such as Alcanivorax borkumensis, produce surfactants that solubilize the oil, whereas other bacteria degrade the oil into carbon dioxide. In the case of oil spills in the ocean, ongoing, natural bioremediation tends to occur if there are oil-consuming bacteria in the ocean prior to the spill. In addition to naturally occurring oil-degrading bacteria, humans select and engineer bacteria that possess the same capability with increased efficacy and the spectrum of hydrocarbon compounds that can be processed. Under ideal conditions, it has been reported that up to 80 percent of the non-volatile components in oil can be degraded within one year of the spill. Other oil fractions containing aromatic and highly-branched hydrocarbon chains are more difficult to remove and remain in the environment for longer periods of time. Bioremediation in the Exxon Valdez oil spill: (a) Cleaning up oil after the Valdez spill in Alaska, workers hosed oil from beaches and then used a floating boom to corral the oil, which was finally skimmed from the water surface. Some species of bacteria are able to solubilize and degrade the oil. (b) One of the most catastrophic consequences of oil spills is the damage to fauna.